Most manufacturers and wholesalers face inventory management challenges with their current Enterprise Resource Planning (ERP) systems. The big question is if it is better to replace the ERP system or to extend it with a best-of-breed solution to solve the problem. The right software solution can undoubtedly improve your business operations, however, one dilemma many companies face is to choose what is the right approach for their business; to add-on to their ERP system or replace it entirely. 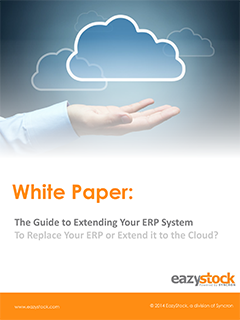 In this white paper we will explore the top considerations when approaching an ERP system replacement versus extending it to the cloud with add-on software enhancements.